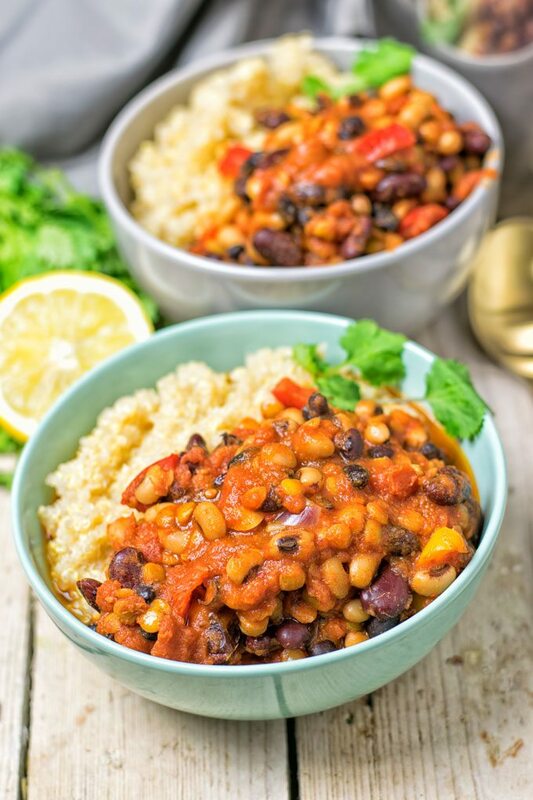 My Lentil Three Bean Chili is the best Vegan Chili you’ve ever made. 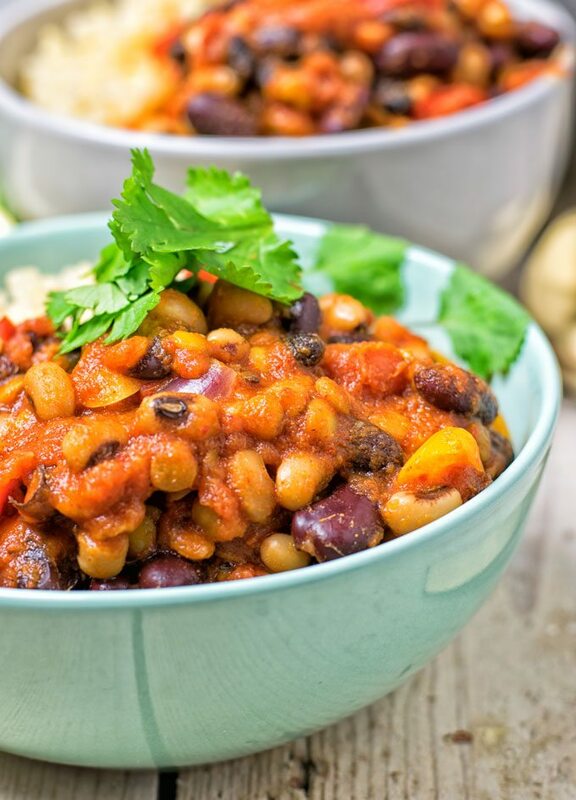 With just 6 gluten free ingredients this homemade chili is full of kidney beans, black beans, and pinto beans. It’s cold here in the Netherlands, so when I come home through cold rain or even snow, I’m craving warming comfort food. Yummy vegan comfort food like my Mashed Cauliflower Green Bean Casserole, or my Healthy Vegan Pizza [homemade, gf]. Whenever it’s cold out there, I have a special desire for soups or stews. 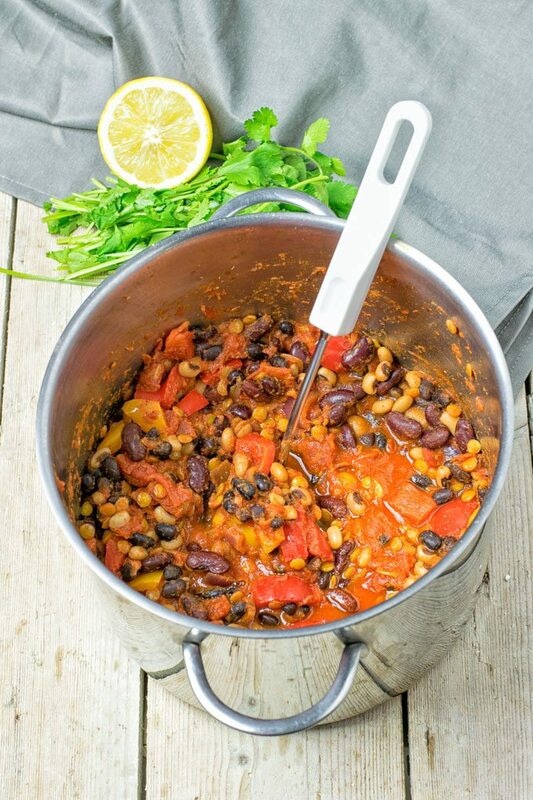 I know that I could eat something like my Cashew Spinach Cannellini Bean Stew almost every day. But literally not every day. That may get a bit boring, so it’s high time to add some new amazing recipe to the list. 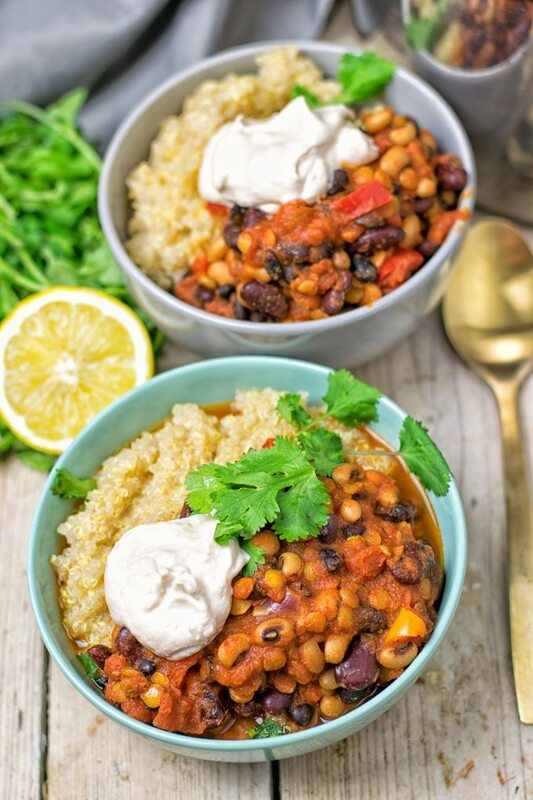 A vegan chili, shall we? That’s why I think you guys will be just as excited for my Lentil Three Bean Chili as I am. It’s hearty, spicy thanks to red chili paste, exciting thanks to the use of 3 different types of beans here, comforting and cozy, easy, customizable, flavorful, and so delicious. I think it’s time to get in the loop so let’s begin! This recipe is a basic to go-to recipe. Feel free to adjust it to your own liking. You can easily add roasted garlic, chopped onions, bell peppers, a sprinkle of lemon juice, and fresh cilantro. Just to give you some ideas. Let’s do it. Heat a large pot and add to your liking roasted garlic, onions, bell peppers. In any case add the chopped tomatoes, red chili paste, and lentils cook for 20 minutes (much longer and things will get mushy and overcooked). This is the time when the lentils are done. So no need to cook according the recommend manufacturer’s directions on your lentil package this time. Add beans and heat for another 5 minutes, ready. Last step: divide into bowls garnish with cilantro, serve optional with quinoa or rice. One word regarding the choice of the red chili paste. Please make sure this is vegan. I have noticed that you have to take a good look at the ingredient list. Not that all are vegan, some contain milk and other non plant based ingredients. I bought a vegan one which was clearly marked as vegan. This way I can be really sure what is in there and what not. If you’re not a vegan or your family isn’t than please ignore this tip and just buy your favorite red chili paste. The combination of lentils and 3 sorts of bean yes (kidney, black and pinto) is so satisfying and delicious. Seriously I could probably eat 10 bowls of this. 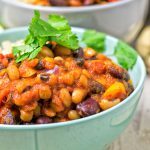 It must be the hearty texture from lentils and the beans that is just a match made in heaven. Then the red chili paste which adds the right amount of heat here, serving this optionally with rice or quinoa make it an absolutely filling plant based meal. It will even be adored by meat lovers, trust me. They won’t miss the meat here for real, the lentils are the secret showstar which add so much texture and heartiness. Friends do you really know spicy food is not only delicious, it’s also really healthy and have so many benefits. 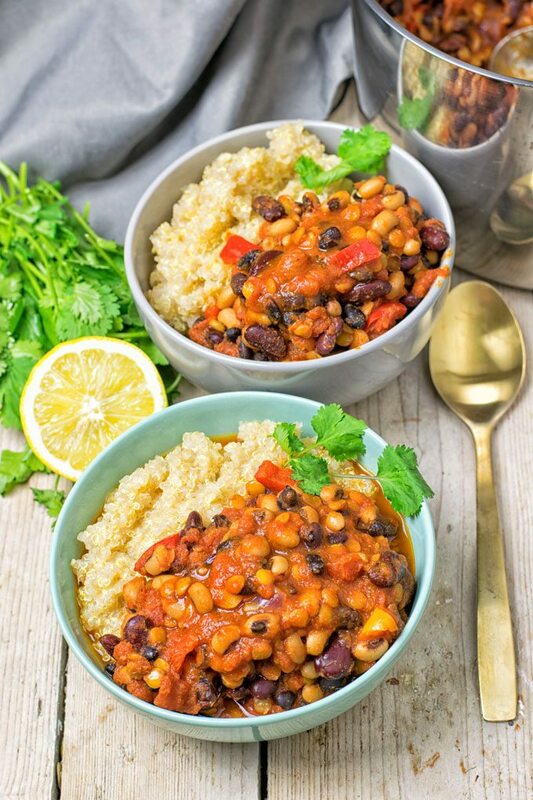 So while you’re munching on a big bowl of this Lentil Three Bean Chili you get the whole package here.That’s why spicy food is a show star for weight loss, maybe you have some good resolutions. I mean it’s almost at the beginning at this year, so this will do the trick with burning some calories just from the heat. Another selling point it’s good for heart health, chili can reduce bad cholesterol. There is so much to discover, curious than check the article “5 Hidden Health Benefits of Spicy Foods“. If you need a warm up, just give this a try. I’m happy to see a tag on Instagram and Facebook as always. Heat a large pot and add to your liking roasted garlic, onions, bell peppers. In any case add the chopped tomatoes, red chili paste, and lentils cook for 20 minutes (much longer and things will get mushy and overcooked). Add beans and heat for another 5 minutes, ready. Divide into bowls garnish with cilantro, serve optional with quinoa or rice. Happy to help and let me know what you think, Del!